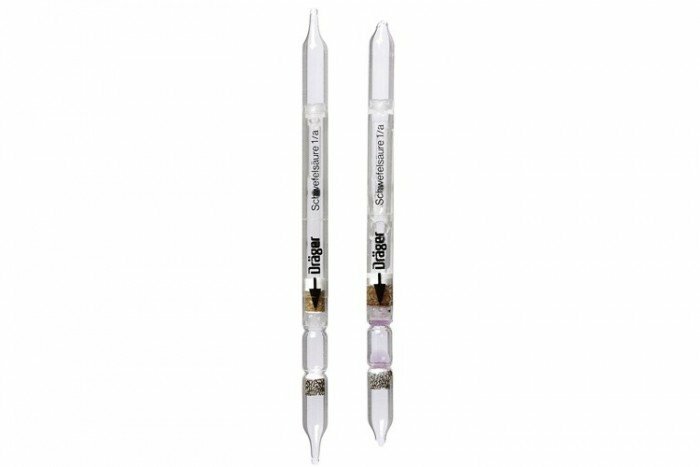 Drager Safety provide these short-term detection tubes for the measurement of sulphuric acid (1/a). The tubes come in a pack of 9 pieces and have a measurement range of 1 to 5 mg/m3. The Accuro Gas Detection Pump from Draeger Safety is required to use short-term gas detection tubes. View more information on this product by clicking here. Sulfur trioxide in the gaseous form is not indicated, but in the presence of atmospheric humidity this forms sulfuric acid aerosols, which are indicated. Soluble sulfates and other aerosol forming acids are also indicated but with different sensitivities. It is impossible to measure sulfuric acid in the presence of these substances. After performing the required 100 pump strokes the reagent ampoule must be broken and the liquid transferred completely onto the brown reagent layer. Wait one minute before drawing the liquid carefully through the brown layer with approx. 1⁄4 pump stroke into the indication chamber. The measurement must be evaluated immediately.